Pindul Cave Tubbing. Pindul cave was attractive caving tour in Yogyakarta. Enjoy the cave does not always mean dangerous in a broad sense. Visiting Pindul Cave you will feel more fun, safe, and adventure experiences equipped shades. Don't missed Pindul Cave tubbing tour when you travel in Yogyakarta. Although this extreme tour, but this cave tour is safe. Pindul Cave itself is located in the village Bejiharjo, Gunungkidul, Yogyakarta. Pindul Cave is a series of seven rivers in the area below. Pindul Cave has 3 zones: the zone light, dim zones and dark zones. 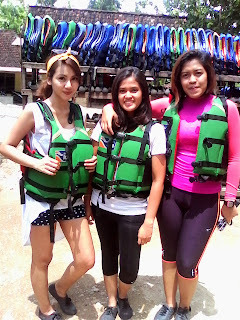 Pindul cave tubing tour is actually almost the same as smooth rafting. Travel requires river rafting rapids and raft, while the cave tubing tour down the river using tires in the quiet streams. Pindul Cave review. Pindul cave tubing tour will takes 120 minutes with a route length of approximately 300 meters. Here you can see the beauty of stalagmites and stalactites in the cave and lodged in it bats. When you enter the pindul cave, you will be treated to views of the "light of heaven". So called because it is said you can see the sunlight coming through the large hole in the pindul cave. In the light zone, you can swim or diving. In addition you can see the fish that live in the river basin. At the end of the journey, you will see stalagmites and stalactites together so it looks like a giant pillar. You can also enjoy the stalagmites and stalagtitnya droplets are believed to make the young. The water in Pindul Cave is not too cold and the cool cave air increase the sensation of serenity you traveled. Beside Pindul Cave, Yogyakarta also have Tanding Cave and Jomblang Cave that both very cool adventure you can get. please do not hesitate to contact : ATOK by email at aswoto69(at)gmail.com for more further information and assistance to arrange your trip plan and visit that cave.